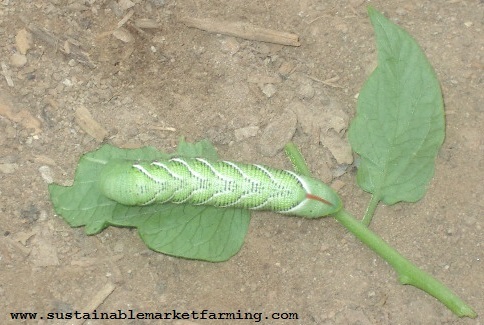 Last week I wrote about hornworms. 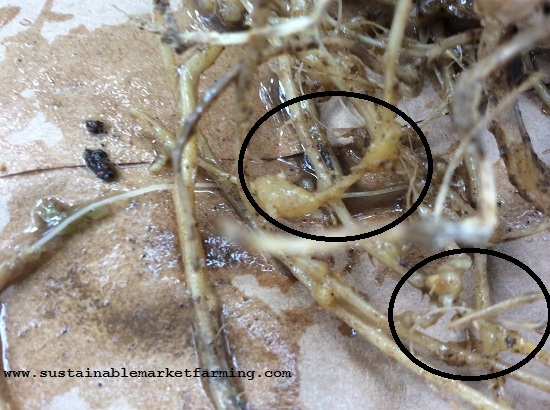 The Alabama IPM Newsletter has a good compilation of articles on tomato worms and various other insect pests. Hopefully you don’t need to read up about all of these! Hang in there! 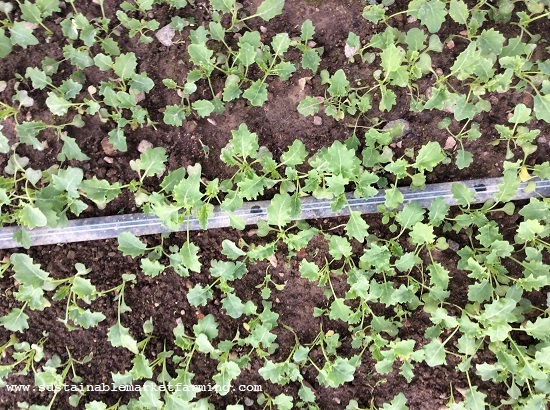 Be careful what you wish for in terms of early frosts! 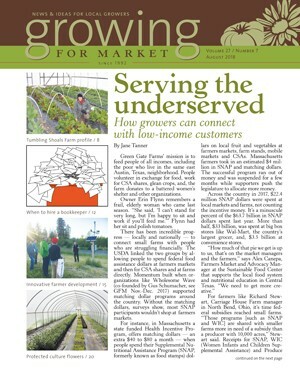 The August issue of Growing for Market is out. The lead article is Serving the Underserved by Jane Tanner. 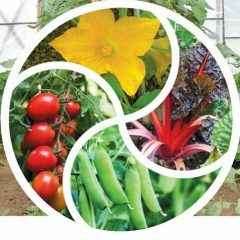 It’s about small farms connecting with people who are struggling financially and cannot easily feed their families good food. Examples include people working for food, gleaning finished crops, farms donating to shelters and other organizations, accepting SNAP cards at farmers markets, and an incentive program to encourage people to use SNAP entitlements to buy produce. Posting a photo of a SNAP card at your booth can help people using the cards feel welcome. The author encourages farmers to take flyers to distribute in the waiting rooms of agencies where people enroll for SNAP, WIC and other benefits. A approach used in central Texas is to post photos of available produce on popular Facebook groups for Spanish speakers that otherwise feature cars and jewelry for sale. The article is packed with ideas. 2018 is year 1 1 for this farm. 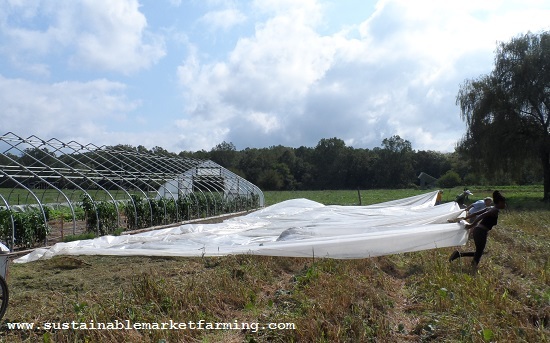 The article continues with info on addressing soil fertility outside and in the tunnels, buying selected machinery, and running a Lean packing shed. For more photos from Ellen’s visit, go to tinyurl.com/y7r8vr5a. The next article is on when to call in a book-keeper and when a CPA, by Morgan Houk. “Why are we asking ourselves to be our own financial advisors too?” We have many other hats, we don’t need this one. Rowan Steele writes “Working Together: Oregon multi-agency farmer development program grows farmers.” This is about providing opportunities for the next generation of farmers, and lowering the average age of Oregon farmers below 60, ensuring that food production continues, and that the land is well cared for. Doug Trott writes about protected culture flower planning, from am exposed hillside in west-central Minnesota. 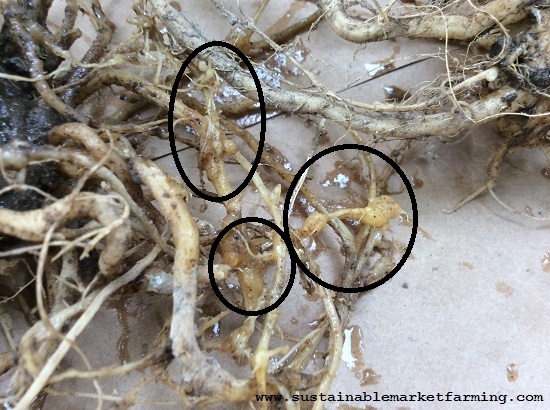 Flower growers everywhere will get encouragement from this careful farm research and practice. 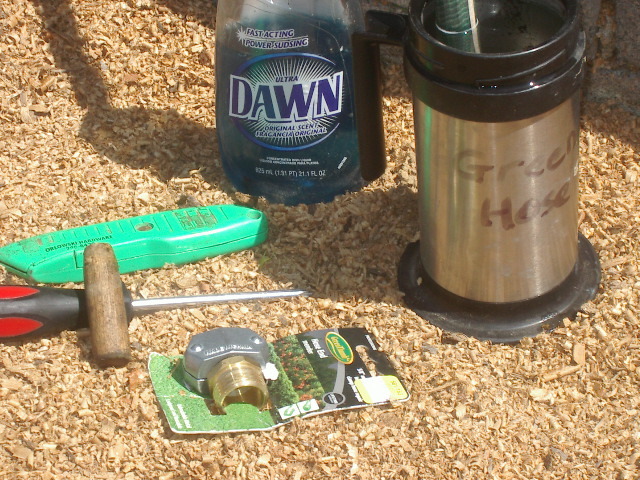 Hose repair tools: repair piece, sharp knife, Philips screwdriver, “wooden finger,” dish soap and unbreakable insulated mug. Mother Earth News DIY Skills and Projects blog is giving more coverage to my Step-by-Step Garden Hose Repairs post. I also wrote about hose repairs here. 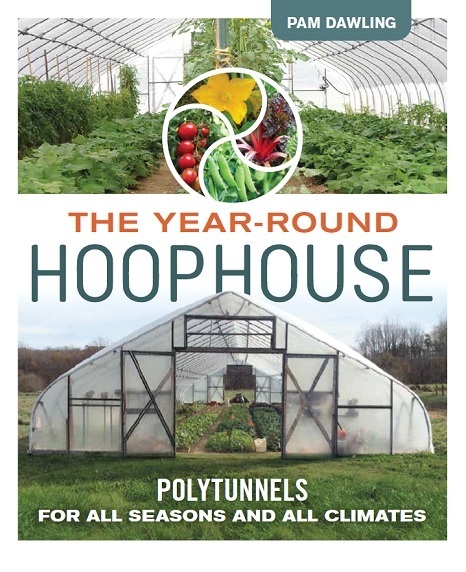 The Year-Round Hoophouse front cover. The Twin Oaks Indexing Crew has finished indexing my new book. Very thoroughly, I’m happy to say – what farmer has time to deal with a poor index when they are in a hurry? All the typesetting is done. Next stop is at the printers. This will take five to six weeks. From the printers it goes to the warehouses, then out to the stores. I should have copies for sale at the beginning of November! I sign all the copies I sell direct through my website and at sustainable agriculture conferences and similar events I attend. 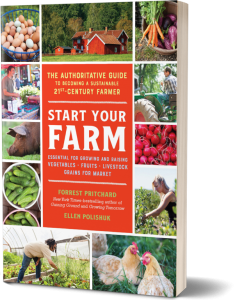 Yes, it is possible to buy the book for less money, but you don’t get a signed copy, and you won’t have the warm heart that comes from knowing you helped support a small scale farmer and author. The amount that an author gets for a copy of the book sold depends on the price the buyer paid and the price the supplier paid. And there’s also the library for those with not enough money to buy. We normally (or do I mean “used to”?) 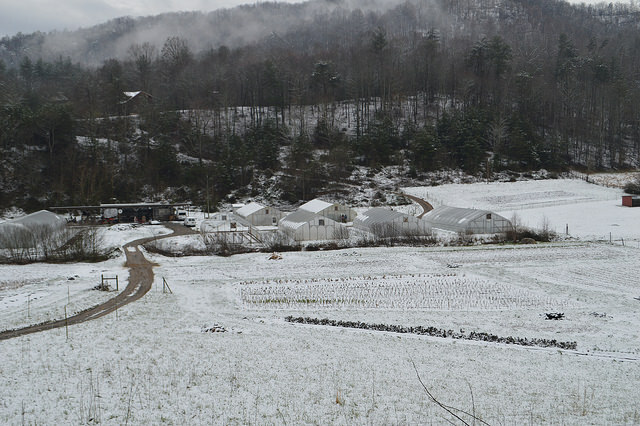 transplant our hoophouse tomatoes on March 15 here in central Virginia. But this year spring is late and cold. Our starts have been struggling in our greenhouse, not helped by our heat mat deciding to give up the ghost. Plus a spot of learning curve errors in not noticing this quickly, or that our germination chamber wasn’t as toasty as it needed to be. Yesterday I decided it was time to adapt to reality, and turned our greenhouse heater up from 45F to 50F. Tomatoes, peppers and cucumbers are not going to do well at only 45F. We’re not getting any solar gain lately because it’s been cloudy. In fact, we’re bracing for snow tonight and tomorrow. 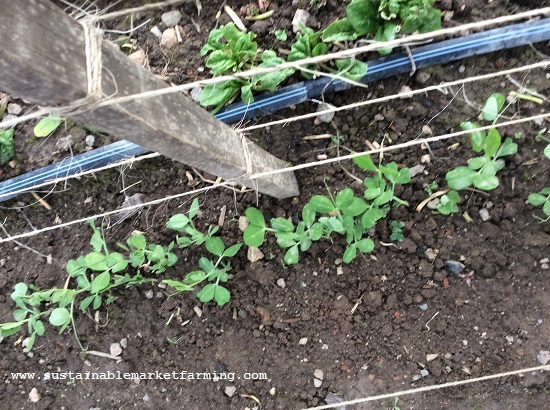 We have measured out spots 2ft apart down the middles of the two tomato beds in the hoophouse, cleared the winter crops from those spots (see the photo above), dug holes, added a shovelful of compost to each hole, and now we’re waiting for the plants to reach a sensible size to transplant. 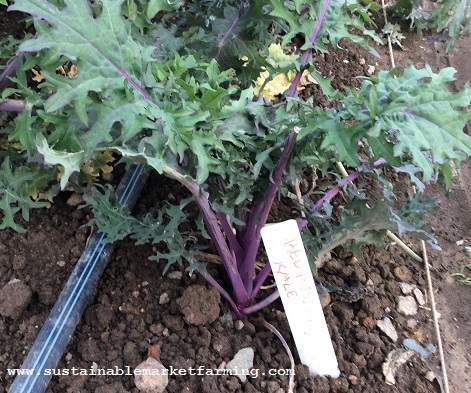 Bare-root Vates kale transplants to go outdoors from our hoophouse. Meanwhile outdoors, we have finished transplanting spinach as bare-root transplants from our hoophouse, and next up are the kale and collards. I wrote about bare-root transplants in January 2017. In the hoophouse we are encouraged by watching our snap peas grow.We planted these February 1, a month earlier than we plant outdoors. That “month earlier then outdoors” is our general guideline for hoophouse sowings after the winter solstice. Our lettuce suffered a big setback/death knell in the New Year cold snap, and it’s a challenge to come up with 5-10 gallons of salad mix each day. Happily we have lots of spinach, several patches of baby lettuce mix and several of brassica salad mix (mustards). 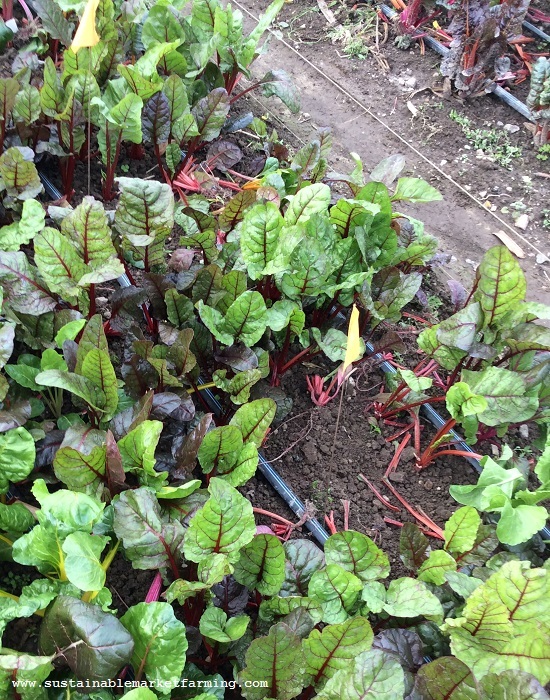 For cooking greens, our Red Russian and White Russian kales are doing very well. The Organic Trade Association is suing the US Department of Agriculture to defend Organic standards for handling of livestock and poultry. On September 13, 2017, the OTA filed a lawsuit against USDA over their failure to implement the new Organic Livestock and Poultry Practices regulation. These regulations would protect Organic integrity, advance animal welfare, and safeguard the process for developing Organic standards. USDA unlawfully delayed the effective date to implement the final livestock standards, several times over. The USDA violated the Administration Procedure Act, because the delays were issued without public process. They ignored the overwhelming public record in support of these Organic standards. The Organic Welfare Rule is the result of 14 years of transparent public work within the process established by Congress. It addresses four areas of practice: living conditions, animal healthcare, transport and slaughter. The Organic Livestock and Poultry Practices (OLPP) final rule was published on Jan. 19, 2017, in the Federal Register, and the government has now attempted to delay the implementation of the rule 6 times – either through the rule-making process or through court filings. It was delayed to May 19, 2017 (because there was a regulatory freeze on new rules). In May it was further delayed to November 14, 2017 and the USDA opened a 30-day period for comment including options to go forward or to withdraw the Rule. There were 47,000 comments, of which 99% supported the rule as written becoming effective as soon as possible. There were only 28 comments to withdraw the rule. On December 15 USDA announced its plan to withdraw the regulation, giving 30 days for comment. Not that this 30 days included 3 Federal holidays. USDA received roughly 72,000 comments (in this short comment period during the holiday season) with an overwhelming majority supporting OLPP. 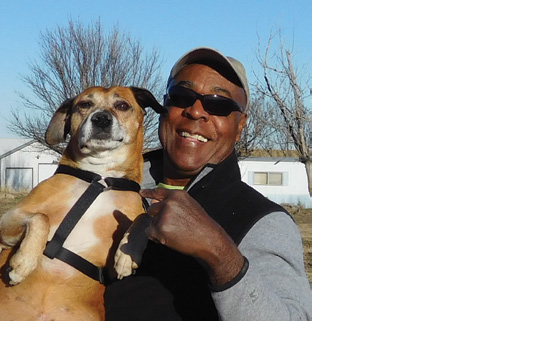 USDA also recognizes that of those comments, only approximately 50 supported the withdrawal – another clear disregard of the record by USDA in its attempts to kill the final rule. Organic producers (the people directly impacted by the rule) overwhelmingly support the rule. Most of the (tiny amount) of opposition is from outside the organic sector. See the Washington Post of January 16, 2018 from 29 Organic organizations demanding a return to honoring the public process previously in place. On March 12, The Washington Post (search for Ag Department kills animal welfare rule for organic meat) announced that the Trump administration, via USDA, has withdrawn the Organic Livestock and Poultry Practices final rule published in January 2017 by Barack Obama’s government. The regulation would have ensured that organically grown livestock and poultry had enough space to stand up, turn around, fully stretch, lie down, and had ventilation and access to fresh air. Chickens and a guinea hen.